Canadians are becoming more aware about counterfeit food and food fraud. Legislation such as the Food and Drugs Act, the Consumer Packaging and Labelling Act, and the Canada Agricultural Products Act are in place to protect the standards and quality of products consumed everyday by Canadians. Understandably, our government has legislated that a breach of these statutes should lead to massive penalties for companies and executives alike. The Canadian Food Inspection Agency (CFIA), which is tasked with enforcing these laws, has not historically punished violators to the full extent of its powers, instead frequently choosing to work alongside Canadian food businesses to help them get back into compliance. But, a recent high-profile prosecution involving food fraud has demonstrated that this permissive and reconciliatory approach to regulatory breaches may have come to an end. 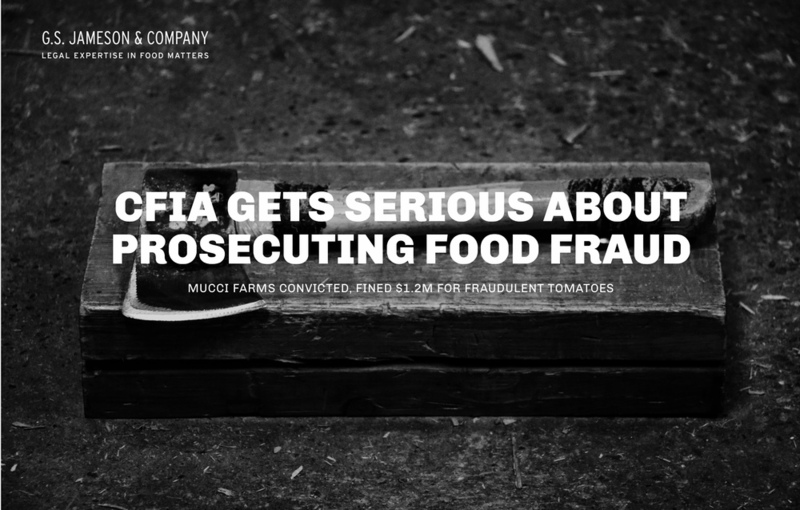 In July 2014, a three-year investigation by the CFIA into the operations of Mucci International Marketing Inc. and Mucci Pac Ltd. (Mucci Farms) found that $1 Million worth of tomatoes labeled as a “Product of Canada” were, in fact, imported from Mexico. The investigation resulted in charges being laid against these companies as well as two Mucci Farms executives. To perform the prosecutions, the CFIA hired an external criminal attorney from private practice, bringing in expertise from outside of the Public Prosecutor Service, while avoiding its administrative challenges and limited resources. Before a trial could take place, all of the defendants entered guilty pleas. The CFIA issued a celebratory press release, while a statement by Mucci Farms effectively said “Our mistake: we sell a lot of tomatoes here.” The Ontario Superior Court of Justice was then put into the unique position of determining how to fine or sentence for such an offence. Notwithstanding the lack of effective guidance for the Court – little relevant case law or precedent to draw from – on June 6, 2016, it issued massive penalties against Mucci Farms: the corporations were convicted and fined $1.2 million and sentenced to three years of probation and the executives were fined $150,000 each and sentenced to three months of probation. With victim fine surcharges, the total fine meted out could eclipse $1.9 million. The Mucci Farms case is unique because, unlike massive health cases with XL Foods in 2012 or the Listeria outbreak in 2008, there was never a direct risk to individual consumers or public health. The indictment alleged only that the produce was mislabelled as to its origin – Mexico as opposed to Canada. So why, then, did the CFIA take such an immediate and punitive approach in this instance as opposed to infractions that resulted in risks to the public? The answer is two-fold: the CFIA is seeking to deter others from engaging in counterfeit or fraudulent activities under its watch, and this style of prosecution is generally becoming more common in Canadian regulatory prosecutions. The CFIA’s mission is philosophically about creating and maintaining faith in the food system – safeguarding food, animals and plants, enhancing the health and well-being of Canadians, the environment, and the economy – typically centred around food safety. In order to maintain trust, the CFIA must also place importance on the ability of the consumer to rely on the labels they read. Canadian food law is filled with complex regulations where rules are notoriously vague and difficult to decipher, and the CFIA generally takes a corrective and conciliatory approach with offenders – actions aligned with the enhancement of the food economy. However, the CFIA decided to enforce on the basis that incorrect country of origin labeling is not merely an errant turn in a maze of tricky regulation, it’s flat out deception and food fraud. The Mucci Farms case endangered Canadians’ faith in a safeguarded food economy enough for the CFIA to depart from its central concern of food safety and prosecute aggressively. Other governmental departments regularly take on public prosecutions with significant fines and often external lawyers. With limited internal resources and increasing legal authority to seek significant monetary penalties, many enforcement agencies increasingly rely on deterrence. Most Canadians are familiar with high profile securities, occupational health and safety, and environment prosecutions in recent memory. Until now, enforcing through monetary deterrence was not an approach that Canadians had seen in the food sector. The CFIA has, for years, worked in a relatively conciliatory manner with contraveners to keep the food system safe from allergens, health risks, and adulterants, while amendments to legislation have slowly given it more authority to fine and charge entities that are in breach of Canadian food law. This prosecution against Mucci Farms and its executives could be a bellwether that there has been a change in the CFIA’s attitude towards its style of enforcement or that the CFIA considered the Mucci Farms infraction as distinct and significant enough to warrant the CFIA to exercise its full authority. Either way, this is unprecedented in scope. Notably, the CFIA chose to prosecute two individual executives in the Mucci Farms case. It has become more frequent to see directors, officers, and managers be named in more regulatory prosecutions. Both from within the food sector and more broadly, individuals can be subject to criminal prosecutions, which can lead to massive personal fines, criminal records, and jail time. Under the Foods and Drugs Act, certain offences can lead to a three-year prison term – a term which is equivalent to a conviction for manslaughter. Most companies and directors are not insured against these types of fines. Commercial general liability and director’s liability insurance usually do not cover indictable offences and, in the case where a defendant is protected by its insurer, it would only be for the defence of the fine and not the fine itself. It’s tough to say whether the Mucci Farms case signals the beginning of a new era of frequent prosecutions and heavy penalties, or whether this case will stand as a one-off example of the CFIA demonstrating its enforcement powers, seeking to scare food producers straight. In either case, the CFIA has put the Canadian food industry on notice that it views consumer trust as central to its mandate. Co-authored by Glenford Jameson and Shannon Paine. This article has been republished by The Huffington Post.